Just like every year I have so much zucchini I don't know what to do with it all. I've already given some away to my neighbor and to Mark. I keep thinking I should keep track of how many I get in a year but always forget. This year I planted one yellow and one green zucchini along with some pattypan squash. For some reason the green zucchini isn't doing as well and I have only picked a couple off of it but the yellow on is going gang busters and I'm sure I've picked at least 20 and there's more on the way. 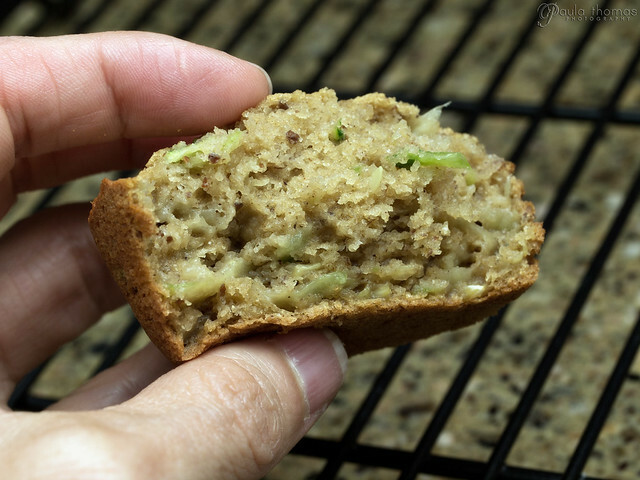 I hadn't made any zucchini bread this year yet so I figured it was about time I make some. I searched for a gluten free and sugar free recipe and came across this one on mindoverbooty.com. It took me a while to find one that I had all the ingredients for. I have some garbonzo bean flour that I haven't tried yet so I searched for a recipe that uses it and that's how I came across this recipe. I pretty much followed the recipe as written but instead of making two loaves of bread I made one loaf of bread and a dozen muffins. I added walnuts to the bread but not to the muffins. It called for agave nectar or honey but I used both. For the past three months, I've been avoiding all forms of sugar including agave and honey. I recently bought some to try out thinking it may be ok to start introducing a little sweetness back into my diet. Maybe it will help me gain some of my weight back. The recipe also gave a choice between chia and flax seeds which I had both. I decided instead of using the whole seeds to use ground flax seeds. It's supposed to be easier to digest than the whole seeds so I try to always use them ground. 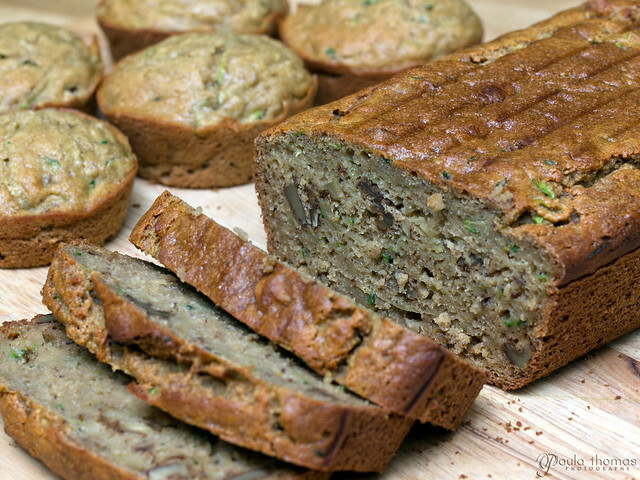 I've made some pretty awesome zucchini breads over the years, but this one just might be my new fav. Hard to believe a gluten free, sugar free bread could be so good but it is. I had to stop myself from eating more than two muffins. The batter was pretty tasty too. Yes, I'm guilty of licking the spatula clean. Here's the version of the recipe I made. 1. Grease two loaf pans or two muffin pans and preheat oven to 350 F or 325 F if using convection. Combine all the dry ingredients in a medium bowl. Set aside. 2. Mix all wet ingredients, except shredded zucchini until texture is consistent. Add the zucchini, followed by the dry mixture, one third at a time. Add walnuts and stir lightly just until uniform. 3. Split batter evenly between two loaf pans or two muffin tins and place in the oven. If using muffin tins you should have enough batter left over for another two muffin tins or one loaf. Make muffins first since they cook faster. Muffins should take 15-20 minutes and bread should take 40-50 minutes. Check with a toothpick for doneness. May take slightly longer if not using convection. 4. Remove from the oven and allow to sit for 10 minutes. Then remove from pan and cool on a drying rack for at least an additional 30 minutes. 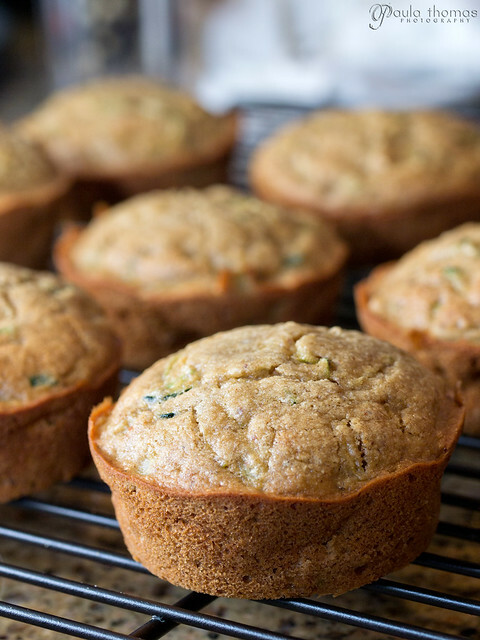 If making muffins, use remaining batter to fill another two muffin tins or a loaf pan and bake as instructed above. Recipe makes 2 loaves, 24 muffins or 1 loaf and 12 muffins.